Sugarfina's Faves are the perfect way to celebrate any special day or just "because". This gold embossed artful gift box includes adorable lucite boxes of Sugarfina's most popular sweets. The 3 piece box candy flavors are Champagne Bears®, Sea Salt Caramels, and Peach Bellini® and the 8 piece box includes Champagne Bear®s, Sea Salt Caramels, Sugar Lips®, Champagne Bubbles, Sugarfina Pearls, Sparkle Pops, Robin's Egg Caramels, and Peach Bellini®. 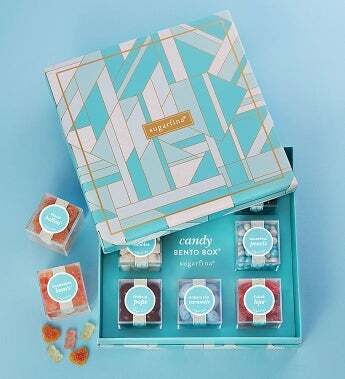 Sugarfina, founded by a couple who love candy and each other, was named one of the world's 50 most innovative companies in 2018 by Fast Company. Send these Faves to your faves! Champagne Bubbles - Delicate, sweet and chic, Champagne Bubbles are one of Sugarfina's all-time favorite gummies. Dressed up in tiny white nonpareils, each juicy little bite bursts with the flavors of the finest champagne. Sophisticated yet playful, they'll love each bubbly "sip." Non-alcoholic and available to ship to any state. Sea Salt Caramels - It doesn't get much better than this... Rich & creamy caramels are dipped in ultra-fine dark chocolate, with just a kiss of sea salt. With premium all-natural ingredients, this is the ultimate indulgence for caramel lovers. Sugar Lips® - They'll want to pucker up to these sweet & sour gummy lips in delicious natural flavors of strawberry, cherry, and watermelon. Kissably-soft and chewy, these sugar lips are dusted in sweet & sour sugar crystals for a lip-smackin' mouthwatering smooch sensation. Sugarfina Pearls - Tiny milk chocolate droplets are coated in a delicate sugar shell, in dazzling Sugarfina hues. Made exclusively for Sugarfina, these beautiful milk chocolate pearls are coated in a mix of shimmery aqua and pearlized white candy shells, so gorgeous they belong in a jewelry box. Sparkle Pops - These crunchy chocolates are filled with popping candy for a big burst of sparkle and pop. Peach Bellini® - Peach with a pucker... These all-natural gummies are filled with a juicy peach center, then dusted in sweet & sour sugar crystals for a mouthwatering taste sensation. They'll be totally smitten with these unique peachy hearts..
Robin's Egg Caramels - A rich and creamy caramel egg center is surrounded in premium dark chocolate, then dipped in a delicate candy shell. A little crunchy, a little decadent, totally smooth on the finish... these caramel eggs will have them tweeting sweet songs of joy.